This collection contains the California Open Educational Resources Council (CA OER) list of peer-reviewed textbooks for Financial Accounting (common course-id ACCT 110), a top 50 college course identified for inclusion in the California Open Online Library for Education (COOLforEd). This is the study of accounting as an information system, examining why it is important and how it is used by investors, creditors, and others to make decisions. The course covers the accounting information system, including recording and reporting of business transactions with a focus on the accounting cycle, the application of generally accepted accounting principles, the financial statements, and statement analysis. Includes issues relating to asset, liability, and equity valuation, revenue and expense recognition, cash flow, internal controls, and ethics. Explain the nature and purpose of generally accepted accounting principles (GAAP) and International Financial Reporting Standards (IFRS). Identify the ethical implications inherent in financial reporting and be able to apply strategies for addressing them. quizzes and examinations, which include problem solving, essay and/or analysis interpretation and presentation. Topics included in the course, such as inventory valuation, receivables, fixed and intangible assets, current and long-term liabilities, will be assessed using multiple methods, as described. Based on International Financial Reporting Standards, this textbook was written by Henry Dauderis and published by Athabasca University professor David Annand, EdD, MBA, CA, Professor of Accounting in the Faculty of Business. It contains 13 chapters and includes discussion questions, cases and comprehension problems. It contains a comprehensive glossary, but the text would benefit from an index. An Instructors Manual for this book is available. Walther's textbook covers a range of financial accounting topics related to the accounting and reporting cycle, current assets, long-term assets, debt, equity, and cash flows. This material is customarily covered in introductory accounting courses, and is foundational for all accountants and business persons. The writing approach is a careful blend of concepts and practice. Great care was taken to construct a seamless presentation that flows along a continuous thought process. The careful attention to design should make the book equally appealing to those interested in using accounting information, or those who want to begin to learn how to work in accounting positions. The accompanying website includes numerous supplements like streaming videos, sample problems with solutions, and other learning tools. 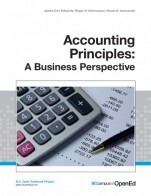 The Hermanson, Edwards, and Ivancevich text Accounting Principles: A Business Perspective uses annual reports of real companies to illustrate many of the accounting concepts in use in business today. Gaining an understanding of accounting terminology and concepts, however, is not enough to ensure success. One also needs to be able to find information on the Internet, analyze various business situations, work effectively as a member of a team, and communicate ideas clearly. This text was developed to help learners develop these skills. The Boundless Accounting textbook is a college-level, introductory textbook that covers the subject of Accounting, core to all studies of business. Boundless works with subject matter experts to select the best open educational resources available on the web, review the content for quality, and create introductory, college-level textbooks designed to meet the study needs of university students. Historically, textbooks have been presented as dry monologues, a one-way conversation that often seems to talk to the teacher more than to the student. Boring and confusing should never be synonymous with any aspect of education. Instead, we seek to promote an active dialogue. Authors, teachers, and students should work together to create an environment where education flourishes. We want you, the student, to understand the nature of our endeavor. 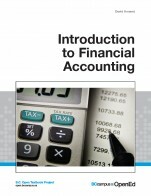 After all, the only reason that this book exists is to aid you in learning financial accounting. If you do not read the chapters because you find them boring or if you do not understand the material that is included, no one benefits. We will have wasted our time. We view this textbook as a guide. In constructing these seventeen chapters, we have worked to guide you on a voyage through the world of business and financial reporting. We want to help you attain a usable knowledge of the principles of financial accounting as well as an appreciation for its importance and logic. By learning its theory, presentation, and procedures, individuals become capable of using financial accounting to make prudent business decisions. That is an important goal regardless of the direction of your career. We have relied on our experience as teachers to highlight the aspects of this material that make it interesting, logical, and relevant.